The EUR/USD is under pressure once again, trading lower ahead of the Non-Farm Payrolls. Weak euro-zone data continues flowing, preventing a pre-NFP calm. The technical picture remains bearish as the pair remains confined to a steep downtrend channel. The EUR/USD is trading around $1.1960, down 0.25% on the day and close to the recent three-month lows. 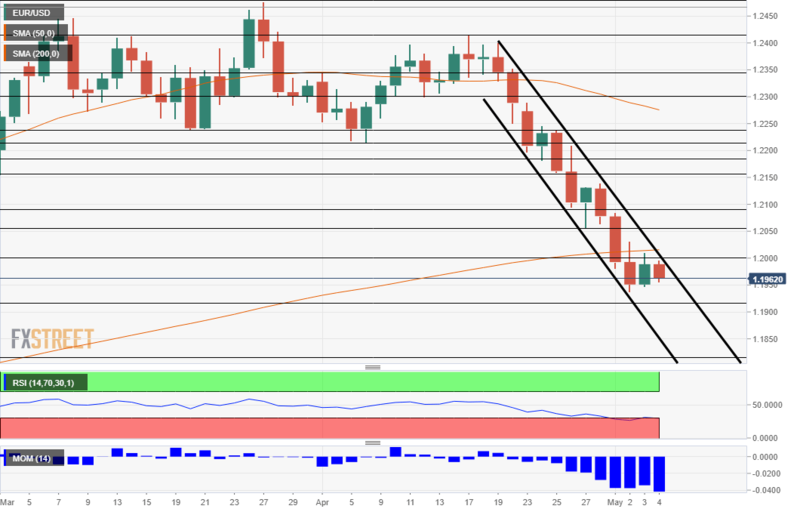 The pair has been falling throughout the week as the US Dollar stormed higher and weak euro-zone data weighed on the common currency. Friday is no different. Markit’s final read of the Services purchasing manufacturers index for April showed a considerable downward revision to 53 points. Revisions are usually minimal in these publications. Moreover, euro-zone Retail Sales increased by only 0.1% in April against 0.5% expected and advanced by 0.8% instead of 1.9% YoY. The early date of Easter this year is cited as a reason for the poor readings today and the disappointing inflation read on Thursday. The Flash estimate for April showed a YoY increase of only 1.2% on the headline and a downfall to 0.7% on the Core. However, with the ongoing influx of disappointing figures, many are asking if the moderation is indeed temporary. The focus now shifts to the US with the Non-Farm Payrolls expected to show a gain of 192,000, back to average rises after a subpar read of 103,000 in March. Average Hourly Earning will likely have more say. An increase of 0.2% MoM is projected after 0.3% MoM last time. Year over year, salaries carry expectations of maintaining the 2.7% rise. The EUR/USD is trading in a downtrend channel as demonstrated by the thick black lines on the chart. The pair is making an attempt to move out of this plunge, but the move is sideways at this point. A failure to depart the channel implies further sharp falls. The pair also continues trading below the 200-day Simple Moving Average which stands at $1.2015 and Momentum remains strong to the downside. On the other hand, the RSI points to oversold conditions as the figure is just below 30. On the downside, $1.1920 was a low point in early January. Further down, $1.1820 was a stubborn line of support back in late December. The $1.1710 level is next line. On the upside, $1.2000 defends the 200-SMA at $1.2015. Further above, the April 27th trough of $1.2055 follows and the peak of 2017 at $1.2090 is next. Next Article Non-Farm Payrolls live coverage – Will wages move higher?